Rejuvenating the area around your eyes brightens and refreshes your upper face giving you a more youthful appearance for your entire face. Thinning skin, sun damage and facial expressions take their toll on the delicate eye area resulting in common cosmetic problems which can be experienced at any age. Natural consequences of aging can make us look and feel older than we would like. Neuromodulators: Anti-wrinkle injections used to gently erase or soften crow’s feet or laughter lines. Belotero: Treat sunken, dark circles under the eyes. Ultherapy Eye Skin Tightening: For a non-surgical, no-downtime approach, we use Ultherapy™ to rejuvenate the skin around the eyes, forehead, cheeks, neck and decollete. Ultherapy is a non-invasive procedure that helps tighten and contour the skin on your eyelids in a single treatment—with no surgery, no injections, and little to no downtime. Ultherapy uses safe, time-tested ultrasound energy to lift and tighten the skin naturally—without surgery or downtime. Sciton Laser: Wrinkles and pigmentation are practically eliminated during this non-surgical eyelift with skin tightening benefits. When the laser beams strike the surface of your skin, they remove old, damaged elastic fibers and collagen so fresh new tissue can grow into these channels. Since only a “fraction” of your skin is affected, healing is quick and virtually painless.can add an eyelift during any laser procedure. During the non-surgical eyelift, the fractional laser beam is broken into microscopic columns of light. A study of over 300 patients showed consistent, satisfying results from the fractional Sciton Laser eyelift, including reduced dark circles, elimination of eye wrinkles, and tighter eyelid skin. Our non-surgical eyelift has many of the same benefits of a surgical eyelift, without the risks and downtime. Best of all, because it stimulates new collagen production, results are expected to last for several years. The fractional laser works very well on darker skin in most cases. However, to be safe, we will perform a test spot on the eyelid area to ensure there is no change in pigmentation. The only issue that a non-surgical eyelift cannot address is bulging fat pads in the eye area. In order to be a good non-surgical candidate, you should also have realistic expectations about the procedure. On average, most people need between 3-5 sessions (spaced apart at 2-3 week intervals) in order to achieve the best results. Medical-Grade Eye Creams: Targets the delicate area around the eye to strengthen the tissue, increase collage and elastin, reduce fine lines, wrinkles, and puffiness and brighten under eye circles. Latisse: An eyelash growth stimulation treatment used to promote thicker, longer, stronger lashes. Is it possible to grow longer, thicker eyelashes? Latisse is a prescription-only solution that has been proven to stimulate the growth of eyelashes. Within two to four months, your eyelashes can become longer and thicker. Latisse is safe and is the only FDA approved treatment for growing eyelashes. Latisse is applied daily with disposable brushes which are included with the product. Latisse is gently applied along the base of the upper eyelashes. After three or four months, Latisse can be used much less frequently to maintain longer, thicker lashes. Latisse can also be used to enhance the growth of your eyebrows. Latisse® – an easier solution for eyelash growth: Today’s woman has numerous choices for enhancing the appearance of their eyelashes. Mascara consists of waxes, pigments, and resins that are effectively used to lengthen, thicken, and darken eyelashes. These effects are temporary and smudging is an ever-present problem. Also popular today are artificial eyelashes and eyelash extensions. These can remain in place on the eyelids from several days to several weeks. Adhesives are used to hold the artificial eyelashes in place. They are removed using solvents which can cause irritation and/or allergic reactions. Another, more aggressive treatment is eyelash hair transplantation. With this method, hair follicles are grafted (transferred) from the scalp onto the eyelids. Imagine how much easier it will now be to simply apply Latisse solution to the base of the eyelashes and within several months see them become longer, thicker, and darker. Learn More About Eyelash Growth: Eyelashes also have functions that are more than simply aesthetic. They defend the eye against dust and other debris that could land on its surface. By triggering the blink reflex, eyelashes protect the eyes from many forms of airborne particles. There are approximately 100 to 150 eyelashes on each upper eyelid. The growth of eyelashes is cyclical, going through 3 stages: a growth phase, a transition phase, and a resting phase. At any given time, numerous hair follicles can be found in each of the different stages. The growth phase of an average eyelash hair is approximately 1 to 2 months. Latisse has been shown to increase the amount of time each eyelash hair remains in the growing phase. The application of Latisse has also been scientifically proven to increase the thickness of eyelash hair as well as the darkness of each hair. This is most likely due to an increased production of pigment within each hair follicle. Typically, within 4 months of application, Latisse can increase the length, thickness, and darkness of eyelashes and improve all the traits that are associated with greater prominence and overall attractiveness of the eyelashes. 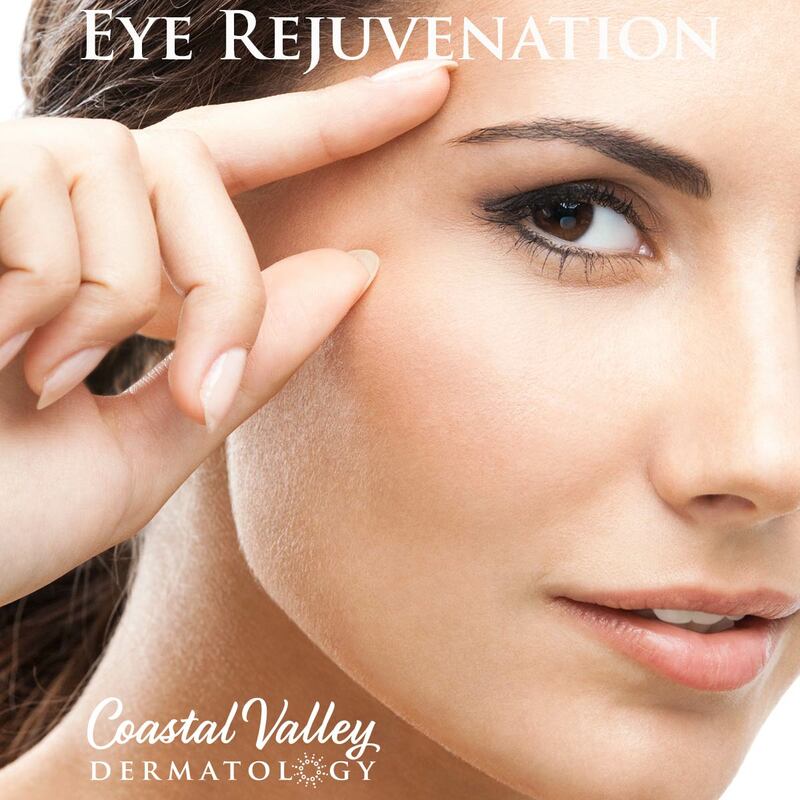 Eye Rejuvenation treatments are quick, in-office treatments for both men and women that require little to no downtime. Eye treatments can be administered separately or in combination to enhance their effectiveness and to achieve an overall youthful, vibrant look. Defy the signs of aging by rejuvenating and brightening your beautiful eyes today. Call 831-293-8458 for a consultation with Dermatologist, Dr. Javid.